The Pit Malibu's purpose is to provide a place for each student to meet & exceed their spiritual, emotional and physical goals. A place where our students are able to draw from and contribute to a setting that is both challenging and reassuring. The Pit Malibu is a place where students are able to achieve goals ranging from losing a few pounds to working on their pro-fighting career. No other school provides the amount of one on one instruction you receive at the The Pit Malibu. I've never trained with a group of guys so eager to help each other. My name is Netti and I started training last year in October. I am from Germany and I am a mother of three kids. It really is not the “normal place” to go in my position. but I did not want anything normal either. I was curious about what The PIT was about and I found exactly what I was looking for - a way to stay fit - in a way that I have never been fit before (I now can do pull-ups :-)) - but most important - all in a way which has a very high quality of purpose and a traditional background of so many years. It is fun and it is also challenging. I feel proud of what I have learned in such a short period of time. It is the passion and dedictation of Kumu Rick that makes The PIT an exceptional place. I just moved into the area to attend school and was looking for a place to train but was a little nervous because I had only trained with my friends and was not sure how comfortable I would be training with strangers. One of my friends suggested I check out The Pit in Malibu because he had worked with Kumu Rick before and told me there was nobody better to have train me. After six months I am in the best shape of my life and my technique improves with every session but most importantly I feel like the Ohana has become part of my extended family. Training is the best part of my day, being part of The Pit Malibu Ohana has made my transition into a new city so much easier and more positive and I am indebted to Kumu Rick and the rest of the Ohana for their willingness to welcome me and teach me. Kumu Rick has trained for so many years in so many systems and has given so much sweat and blood to hone his knowledge and techniques yet he is so willing to pass it on to us his students and that is a kind of generosity I have rarely found before. Kumu Rick is always respectful, kind, generous and has a wealth of knowledge I have never before encountered and I feel privileged to be on the receiving end of it and could never say enough good things about my experience as a member of his Ohana. When my 4 year old son Jake told me he wanted to take karate, I wasn’t completely convinced he had any idea what he was talking about. (I’m fairly certain, he became interested in karate after finding a promotional card from The Pit Malibu in a stack of mail, which he insisted on carrying around for a few weeks and every now and then he asked me to read it.) Nevertheless, I told him we’d give it a try. To be honest, I was just thrilled that The Pit Malibu would be on our way home from pre-school, in it’s super convenient location on PCH. Little did I know, Kumu Rick would be so fantastic! It has by far become the highlight of Jake’s week. If it was an option, he’d go every day. He has since turned 5 and earned his yellow belt last month. Wow! The pride that I felt could only be matched by his own. He works hard and has so much fun in class thanks to Kumu Rick. He is simply a phenomenal instructor. Each week, I am in awe as I see how he challenges the kids in such a supportive environment, all the while earning their utmost respect. It’s truly a balance of focus and fun and so much more than I ever anticipated. I have never met a more patient and dedicated teacher who genuinely cares deeply for his students and their progress. He will meet them wherever they are physically and emotionally. I could not recommend The Pit more highly. It is not easy work physically but you will see results and again, Rick will patiently meet you where you are in this regard as well. I highly recommend The Pit Malibu to anyone who wants to learn martial arts. I started taking my kids to The Pit when they first opened in Malibu about 10 years ago. Kumu Rick and his Wife Sharine own and run the school. They are amazing people! They are incredible with children. My kids still love going to the school. The Pit is like a hidden gem. My teenage Son, who has special needs, has been in private training with Rick for over 2 years. He has learned new skills, gotten in good shape and developed confidence. His instructor has also been a wonderful mentor. My Son really enjoys his time at The Pit. I've been training various martial arts for over 20 years and can say that The Pit is one of the best martial arts environments I have ever been fortunate to train at. The Pit has a vast group of individuals training there, between very young children to kids, to teens, to adults, all of whom are loyal to one another, loyal to the school, and have created a family feeling that makes you feel safe from criticism. Training at The Pit has given me a new revived desire to train harder than I did when I was a kid, and I can only hope my body allows me to continue training here until my body no longer allows me to. If you're looking for a trustworthy environment to train at for yourself, or for your children, The Pit gets top honors from a veteran of the martial arts world. Don't think twice about it. We are so grateful to have found The Pit. My Son has been training since he was 11 yrs old(he is 17 now) . He didn't want to do any sports . As a parent I tried to convince him to do soccer, baseball, surf you name it but he didn't seem to be attracted to any kind of physical activity until we found The Pit. From day one I knew we were in the right place. They welcomed him like one of their own. Their high ethics and principle is a contribution in building my sons character . Their approach to the practice is in the most pure sense of what martial arts should be..no egos in the class, a humble yet confident attitude , encouragement and positive criticism , courage ,respect and values and above all, heart and love for mixed martial arts. I took the women's morning classes for a while and eventually tried out the evening classes. I always walked out feeling that I had learned and achieved something new. I've always been painfully shy and really wanted to learn some self defense and get into shape but I found other gyms really intimidating and not very friendly to newbies. Sharine was super welcoming and friendly and she could tell I had obviously been a couch potato for a while, she pushed me just enough that I had an excellent workout but I wasn't in over my head. I saw results extremely fast too which was awesome, especially in my arms and shoulders. I was able to do pull-ups finally :) the evening classes are intense but really fun! Everyone was super cool and the higher belts actually seem to enjoy helping you improve. As a girl I never once felt out of my element or unwelcome even when the class just happened to be mostly men that day. Sometimes I would arrive early and hang out with the parents while the kids classes were going on, I couldn't get over how disciplined the kids were and how far some of them had come in a short amount of time. Some of the kids have been there a good couple of years now, which is always a good sign right? Kumu Rick, Sharine and their son Sage impart the perfect balance of discipline and caring. Both Sharine and Rick have backrounds in education and are adept at imparting the values of martial arts, while still remaining approachable and loved by the students. They also both have a passion, not only for the various disciplines they teach (Kempo and others), but for fostering the kids from wee little ones to adults. We have been going to the pit for nearly 4 years now and my almost 9 year old son loves everything about it. It has been a wonderful experience in so many ways! I have attempted virtually every type of sport imaginable and excelled at most of them. However, I have never found anything that even approaches the elite level of fitness training at The Pit Malibu. Expert instructor Kumu Rick Metzler has devoted more than two decades of his life adapting his classical martial arts mastery, modern innovations, and inspirational teaching into the most effective fitness program ever devised. From young children to adults looking to get into the best shape of their lives to aspiring mixed martial artists, everyone who trains at The Pit Malibu learns to respect others, enjoys world class conditioning, and has fun every step of the way. When I was younger, I practiced Tae Kwon Do. I really enjoyed it originally, but as I progressed further I developed two major qualms. First, the techniques I was taught were not all that useful in real life. Second, as a result of the emphasis on form during class, there was little time left for conditioning. After earning my black belt, I turned to traditional sports like soccer and basketball to increase my fitness level. After recently joining The Pit Malibu, I have come to regret the leave of absence I took from martial arts. The Hawaiian Kempo we practice is balanced, with traditional form mixed with techniques that are realistic for use on the street. Additionally, the conditioning is intense and rewarding. I was in pretty good shape when I joined, and my fitness level has increased exponentially in the past few months. More importantly, the environment is very positive and everyone is eager to help everyone else learn. As a law school student, I don't have a lot of free time in my schedule, but I'm happy to have the privilege of spending a few hours each week training at The Pit Malibu. 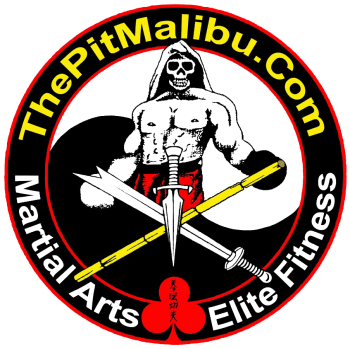 The Pit Malibu is a place where everyone from young kids to elite athletes will learn the value of fitness, respect, and tradition through Hawaiian Kempo. If I had kids, they'd train at The Pit Malibu. Rick Metzler's passion, commitment, and knowledge is unparalleled. I'm constantly impressed by the core values he instills in his classes and programs. The sport-specific conditioning I've developed from his classes has been an excellent addition to my own training. Parents, kids, elite fighters, and everyone in between, will benefit by making The Pit a part of their life – I certainly have. My original inquiry into training at The Pit came with hesitation. I was in my later 30s, and my Dad said I was supposed to pick up golf at my age, not mixed martial arts. However, Kumu Rick assured me that The Pit is a family gym, and after a year training with the Ohana, I now understand how honest his words were. As Kumu told me, all of our journeys are different, and my only goal should be to be the best 'I' can be. The students at The Pit are not out to compete against other students, because they are already competing against themselves, trying to be the best they can be. There is comradery between students as we help each other achieve the best. I highly recommend The Pit Malibu to anyone, as it is a special place. My name is Zackary Adler I am thirty one years old and I have been studying and training at THE PIT MALIBU under Kumu Rick for almost a year. I had previously trained at The Inosanto Academy in Venice Beach for some time. I can not say enough great things about Kumu and the Pit. I am a film director, a new father, and it is safe to say that a good part of my sanity, focus, peace and physical and mental health is very much maintained by my training at the Pit. Whether you are a parent, a athlete or someone who is hoping to improve their physical and mental health I can sincerely recommend The Pit as a safe, fun, professional and serious place to work to better you or your children's life. An honest personal testimony I can give is that while contemplating moving back to NYC or Europe a major factor that plays in me staying in LA is that I want to continue training at The Pit. Oh! Im not leaving... The Pit is a major reason why I want to be here.